Just days after purchasing Mercado, Omniture makes another announcement: "a community Web site designed to help our customers build applications that use their Omniture data". 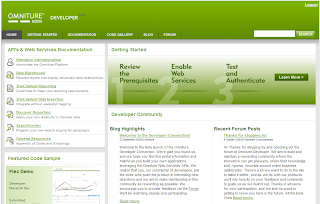 I went straight to the Omniture Developer Connection and had a look: it's promising! Like one of my old boss said, "opening the kimono" is a good thing! This will give heavy users and partners of Omniture an opportunity to collaborate & share useful enhancements and ideas. A quick look at the API documentation reveals a clear and simple set of calls to make interesting use of reporting, imports/exports, data warehouse calls, SearchCenter and Discover. Let's hope there will be a sufficient number of advocates to make it work! I already have lots of ideas for additional vendor specific features in WASP. But this will have to wait until "post WASP v1.0 launch". I'm seeking to enroll at least 2 vendors and 2 agencies before launching WASP v1.0. Of course, the economic downturn is playing me tricks, but vendors who participate in my Corporate licence program will have the opportunity to influence WASP features for enhancements specifically targetted to their users. If everyone is looking down, are you looking up?